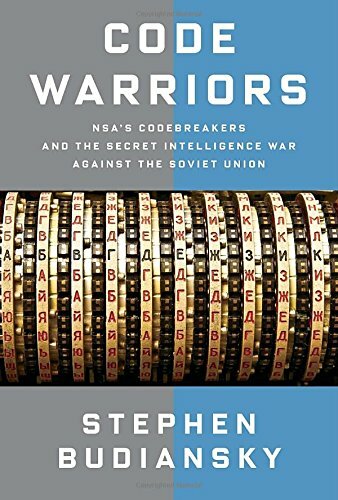 Code Warriors is an Informative, well balanced, and eye-opening history of the NSA enjoyable for non-specialists and crypto-experts alike. The timeline of Code Warriors spans the 1940s through the fall of the Berlin wall in 1989. The prologue begins in 1949 with the British disembarking Latvian nationals, former Nazi collaborationists, who are now spies for the West behind Russian lines in the Baltic territories—deposited by way of former Nazi E-boats piloted by former Nazi West German naval officers. With the British success, the CIA gets into the game by use of unmarked C-47 cargo planes piloted by Czechs, dropping spies by parachute into the Ukraine. Only thin information is ever returned. Not until 1951 do the spies’ handlers realize their operation was blown—blown from the start. Though not until 1956 was the operation was turned off. Of the 100 agents sent by e-boat and the 150 agents delivered by parachute, all were killed or turned; a failure rate of 100%. Not an auspicious start to the Cold War. Yet America’s spying on the Soviet Union actually began years earlier. Access to Soviet coded traffic started in 1943 before the creation of the NSA, after Russia became an ally in WWII. During WWII code breaking was called “Signals Intelligence” and handled by the U.S. Army and the Navy. The Army Signals Intelligence Service (SIS) branch was housed at Arlington Hall in Virginia, where 100 copies of Turing’s “bombe” were built to break German Naval codes. The difficulty in breaking Soviet codes was due to the Soviets using “one-time pads,” a code considered unbreakable when the key (the “pad”) is the length of the message and used only one time. One-time pads aren’t actual “pads” but at that time were paper tapes fed into Teletype machines onto which operators typed clear-text messages. Due to poor “operator discipline” (i.e. not following the rules) Soviet pads were sometimes used more than once, allowing an “in” toward code breaking. The end of the war saw a rush to capture German code breakers to see what they’d learned about Russian codes. A team of U.S. cryptologists was sent to Germany at war’s end similar to the Monument Men. The TICOM team (Target Intelligence Committee) met with success, recovering in one cache four tons of documents in 29 waterproof containers from the bottom of a lake—the complete archives of the German high command’s cipher bureau. In another cache, TICOM retrieved Soviet one-time pads from the Finns who were fighting the Russians in 1941. The end of the war also saw the U.S. transition from wartime to peacetime spying. There was both a need to rebuild staff, as mathematician/soldiers were eager to leave the military, and a need to put the spying on a legal basis, something not necessary during wartime. Despite the slowdown on the American side, spying did continue. In September 1945, three days after the end of WWII, Soviet code clerk Igor Gouzenko defected in Canada, providing the revelation that the Soviets had penetrated the U.S. atomic bomb program. Gouzenko implicated a dozen Canadian scientists and provided information helpful to breaking Soviet codes, an “in” that led to catching more spies. And though Soviet duplicate one-time pad use ended with the end of the war, U.S. cryptologists were kept busy decoding wartime messages until 1980. Budiansky explains the big picture revealed the Soviets to be good at spying, counter espionage, and counter surveillance. “The NKGB was playing the long game, for keeps.” He provides historical background for the Cold War, describing the roles of George Kennan, the Marshall plan, Senator McCarthy and FBI loyalty checks, and the creation of the CIA. Although the Soviets improved their cipher security, and the ability to crack their codes became more difficult, the Soviet Union still transmitted internal civil radio messages in the clear. “For several years, the plan-language effort would . . . be one of the primary sources of information about the Soviet atomic program and one of the few means to monitor warning signs that might indicate mobilization for war.” And because their transmissions were sent in the clear, in 1950 the U.S. was able to process one million messages per month, the NSA’s first plunge into massive data collection. Signals intelligence through the capture of electronics emissions (ELINT) also assumed greater importance. The author describes “Ferret missions,” signals intelligence surveillance flights to listen in to the Soviet Union’s radio and radar transmitters. Of these flights, thirteen U.S. surveillance planes were shot down leading to the deaths of more than 90 Americans. The shoot downs were kept secret by both sides. With the Soviet Union’s first atomic bomb test in 1949 the Soviet Union became the top priority for U.S. signals intelligence. As North Korea was not on the list of SIS strategic concerns, North Korea’s advance into South Korea was not detected before it began. The North Koreans’ early military transmissions were initially unencrypted though the U.S. had few Korean translators. Decrypts of later North Korean transmissions revealed the when and where of attacks, allowing the U.S. to prepare defenses and preemptively counter attack. U.S. radio interception of North Korean communications remained poor throughout the war as the Soviet Union remained the primary target. The U.S. initially thought the North Korean attack was a prelude to a Soviet attack, though the Soviet Union, too, was surprised by the North Korean attack. After the U.S. retook the Korean peninsula from Inchon and threatens the border of China, Budiansky describes General McArthur as increasingly out-of-touch and out of control. Though McArthur discounted the looming Chinese counterattack, SIS knew different because Chinese radio transmissions were sent in the clear. North Koreans switched to one-time pads in 1951, but Soviet voice transmissions of ground control in support of Russian fighter pilots operating in North Korea were sent in the clear. Because the U.S. employed a large number of Russian translators the messages were quickly translated, and the superiority of U.S. fighter jets over their Soviet counterparts was due to better intelligence. The fact that U.S. fighter pilots were fighting Soviet fighter pilots over North Korea was kept secret until the late 1970s. President Truman had little say over the priority of what was decrypted, and as the SIS was a military branch, it unsurprisingly prioritized decrypting Soviet military over Soviet government messages. Lack of control plus bureaucratic infighting (Army vs. Navy) over funding signal intelligence led President Truman to create the NSA in 1952. A “civilian” NSA would be under the president’s direct control. The spy scandals of the 1950s are covered, including British double agents Kim Philby, Guy Burgess, Donald Maclean, and the atomic secrets spy Klaus Fuchs. The Soviet “Venona” messages decoded in 1950 uncovered the cover names of Julius and Ethel Rosenberg, American spies who acquired American atomic bomb secrets for the Russians. Not all the American successes were in catching spies. The U.S. secretly dug a tunnel under Berlin to tap long distance phone lines between East Germany and Moscow. The existence of the tap was soon revealed by a double agent, but the discovery was kept quiet by the Russians because KGB lines didn’t go through the tunnel and the KGB was on unfriendly terms with the Stasi, their East Germany counterparts. Though Khe Sanh was a diversion for the Tet Offensive, and the Tet Offensive failed quickly, it took 76 days and a force of 20,000 allied troops to relieve the Americans at Khe Sanh. Because of these attacks, President Johnson decided not to run for reelection. Arthur D. Little, a consultant group hired in the late 1970s to review the NSA’s management practices, reported that the NSA’s management was seriously dysfunctional, calling NSA’s management “paranoid, untrustworthy, and uncooperative.” Though the CIA was nominally in charge of the NSA, another 1970s internal memo shows the NSA answerable to no one but the president. The NSA’s luck in avoiding scandal ran out in 1975, when the NSA agreed to give a full account of its illegal operations, including its long-running (started during WWII) arrangement with cable companies to copy every international telegram. The project, code-named Shamrock, directly tapped the cables, teleprinters, and other communications devices of 60 to 70 foreign embassies. Another illegal program, project Minaret, starting in 1962, kept a watch list of 1600 American citizens, including Reverend Martin Luther King Jr., boxer Muhammad Ali, historian of cryptography David Kahn, and humorist Art Buchwald. A breakthrough in Soviet ciphers came about in 1979 that is still classified. With this breakthrough signals intelligence detected advance warning of the Soviet invasion of Afghanistan. The breakthrough was given up to the Soviets by former NSA agent Ronald Pelton who was caught in 1986 and sentenced to three consecutive life sentences. Pelton was released from jail last year. Code Warriors is an Informative, well balanced, and eye-opening history of the NSA. Author Stephen Budiansky writes in an exciting and forthright manner. Robert Schaefer is a Research Engineer at MIT Haystack Observatory.